Badenhorst was born on 10 October 1962 in De Aar, Orange Free State, South Africa. As a sportsman he played rugby union, but excelled in the sports of weightlifting and powerlifting. Before Badenhorst competed for South Africa internationally on the strongman stage, he first represented his country as a powerlifter. Between 1988 and 1990, Badenhorst won three world titles in the World Powerlifting Congress organization. In so doing, he broke world records in the squat at 450 kilograms (990 lb), and the deadlift at 402.5 kg (887.4 lb) He also broke the world record in the total (squat+bench press+deadlift) of 1102.5 kg (2431 lb). His world titles and world records led to him being acclaimed the greatest ever powerlifter at the time, with his totals having beaten the likes of Lars Noren, Don Reinhoudt and Bill Kazmaier. Having reached the pinnacle of the sport of powerlifting, a lack of financial incentive led him to strongman competitions. Badenhorst was eight times South Africa’s Strongest Man. Badenhorst was also a seven time World’s Strongest Man finalist, coming second at the 1995 World’s Strongest Man and third at the 1996 World’s Strongest Man contests. 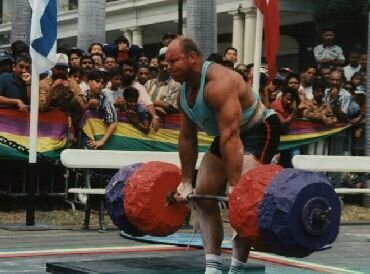 At the 1994 World’s Strongest Man he again came fourth. Determined to improve, and having won South Africa’s Strongest Man once again, he entered the 1995 World’s Strongest Man as one of the favourites. Despite an injury sustained in the Bavarian stone lift during the qualifying heats, he came second overall to Magnus Ver Magnusson in the finals. He competed in a further five World’s Strongest Man contests, coming third in 1996, and 7th in 2000. Badenhorst won his heat at the 1998 World’s Strongest Man and qualified for the final, but sustained an injury and was unable to compete.